Know Thyself. The imperative has been circulating since the togas were in fashion and still remains an ideal. For some of us, the desire to please, the pursuit of acceptance still trumps more often than we care to admit. For others, the footprints are well caked in the path. Living “authentically” in each breath and decision. There is no crisis of identity, only a daily unfolding and refining. In the Finger Lakes, people have been making wine for decades. It is a region where people expect to find great Riesling, and they will. As the growers and winemakers try their hand at different grapes and processes, they are forming their own identity. With each year, the grapes share more of their story. The winemakers refine their personal style. And yet, in the two tasting experiences I have had while here, there were some definite surprises. Hector Wine Company began making wine in 2009. They describe themselves as “quality-driven” with the philosophy that winemaking is equally a creative and scientific endeavor. We were surprised to see Sauvignon Blanc, and even more surprised at how much we liked it. We sampled a Riesling that had been oaked, a collaborative wine under another label, another identity. We had a Cabernet Sauvignon with a deeply saturated color, surprising for a cold region. They are forming their identity with each harvest, experimenting and challenging expectations. After a variety of studies, ranging from Philosophy to Plant Chemistry, Dave Breeden chose to pursue winemaking. 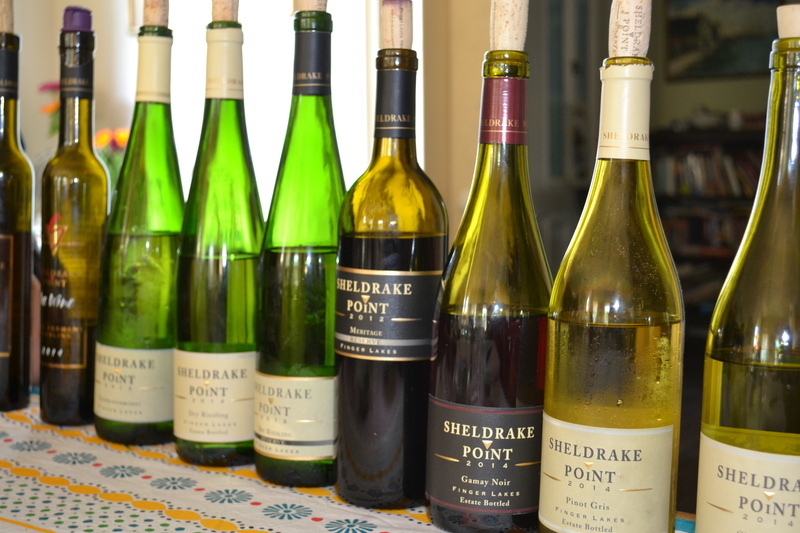 He has been with Sheldrake Point since 2002 and has been paring down their offerings to those that best reflect the region. A portfolio that began with about 35 wines has been trimmed down to 16 or 17. By the end of the year, there will be only two reds. Breeden is committed to allowing the grapes speak for themselves, to tell the tale of the region without filter or manipulation. The smallest bit of oak gleaned from staves in the Chardonnay is from an oak that was once on the property. Even his oak speaks of the Finger Lakes terroir. And yet there were surprises. A Gamay, savory and bright. A Dry Riesling and a Reserve Dry Riesling, picked from the same plot, with the same numbers, same treatment, worlds apart. The Dry Riesling sang lovely notes, the Reserve took the aria to the next octave. The 2014 Wild Fermentation Ice Wine would not be contained. Picked while the moon shone bright and the temperatures dipped into the teens, the harvest was abundant. While the Ice Wine was being made, a slow and meticulous process, a tank of cold-pressed juice became impatient. When tested in April, it had chosen to ferment itself, the brix suddenly dropped. It knew its path and was determined to get there. And then I had my own crisis. The sun was low coming through the window, time had passed more quickly than anticipated. The wine writer in me wanted to stay and ask bottomless questions. To sip and share and inquire. Sitting with a writer and a winemaker, both of whom had works I was wanting to devour, and yet my children were calling. Bedtime was looming. Anxiety, building. “Is there one you’d like to take home?” One? How about 10? I could still smell the samples of Quiche, marbled with farm fresh onions and thyme. I wanted the Gamay with that so that was the first wine I mentioned and it was in my hands before I could protest. I spent the ride home thinking about the Riesling. That gorgeous, vibrant Riesling. I should have asked for the Reserve Riesling! And then the larger crisis reared its head. In less than a month, when my son goes to Kindergarten, will I still be a SAHM? Does the Stay-at-home label still apply to moms that have children in school? Is that who I want to be? Rebecca Barry had opened her heart, mind, and home to us. Colorful and inviting, a home with soul. Her latest book, Recipes for a Beautiful Life was written in the place where I find myself. The “mom” superceding the story-teller, the daily consuming the vision. And here, in her living room, tasting wine with her brother-in-law, I had an epiphany. “Do you know what is next?” What is next? The question that has consumed me. My crisis of identity is simply a path. It is a path that I will take, one step at a time. I will pare down, I will choose the unexpected. I will listen and I will make my voice heard in ways that I can’t yet anticipate. Know Thyself. It is also a warning. It says, “pay no attention to the masses.” It is a proverb that encourages. It is an ideal. And as the region refines its identity, as each grape tells its story, it is gaining a voice, a voice that deserves to be heard. I understand. This was written as a delayed entry into the Monthly Wine Writing Challenge. Since I am on the road and the story only came to me after last night’s tasting, it is late. However, the wines of the Finger Lakes will be highlighted in the coming weeks at Wine Bloggers Conference. I wanted to whet the whistles of fellow writers before I got back off the grid. I will share more detailed tasting notes in the near future. Thank you, Rebecca for opening your home. Thank you, Emma, for your cheerful, knowledgable service. Thank you, Dave for the gift of delicious wine and your time-an experience I won’t forget. Cheers! You will find your path, I’m sure.